Saddleback Community Church offers the “40 Days of Purpose” program for $750. However, you can get it for $500 by ordering through the United Brethren denomination. However, registration at this rate ends January 19. “We are again faced with making another decision in regard to continuing at the Caribbean Graduate School of Theology for a third year. When we went to CGST in the summer of 2002, it was for only one year when a national was to return to the Graduate School after completing her doctoral studies in California. However, that did not happen. She expects to complete the degree in the summer of 2004; however, she desires to remain in California to complete the internship required to be licensed in the State of California as a psychologist and to get certification from the American Psychological Association. 13 Jan Pastoral Resignation in Coleta, Ill.
James Holloway resigned as senior pastor of the Coleta church as of December 31. He will not be reassigned. The Coleta Church will be using several different people to fill the pulpit for now. Lamar and Karen Crumbley, who had been helping with the Macau English Language Program since September, returned to the States on December 27. Russ and Nellie Birdsall arrived on January 10, and will serve as volunteers in Macau through May. This is their 6th time to Macau. The ELP hired a new secretary, Tommas, who started working on January 2. His first two months will be on a trial basis. “On Sunday, January 4, we had impromptu 40th anniversary celebration of having church in that building. Among those present were ten members who were there 40 years ago, including Archie Carpenter, who will be 90 in June 2004. They were asked to share what they had remembered about that day. Some shared how they met in the basement part of the building because the upstairs (sanctuary ) wasn’t finished. In time they were able to meet upstairs, and the downstairs became Sunday school classrooms. It is now the youth room with new carpet and furnishings, just done this last summer. Jim Ellifritt Sr. (right) and Jim Ellifritt Jr.
Amy Ellifritt knows what it’s like to be a soldier’s wife, and a soldier’s father. Her husband, Jim Sr., is on his way to Afghanistan for a year. And her only son, Jim Jr., is on his way to Iraq. 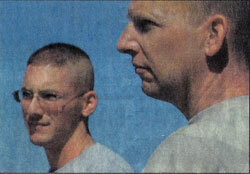 Both are members of the Oregon Army Reserves. Rev. Jim Ellifritt, an ordained UB minister, serves as superintendent of Northwest Conference and is director of the County-Wide Chaplaincy program, a donation-supported crisis intervention ministry. He and previously pastored the Friendship UB church in Vancouver. But for the next year, he’ll be going by the title Lieutenant Colonel Jim Ellifritt. Army Reserves unit has been called up to help rebuild Afghanistan’s infrastructure. He went on active duty in October, learning the Dari language spoken in Afghanistan. ” I have about 200 hours of reading, writing and speaking under my belt,” he says. And now, he’s on his way to Afghanistan. He serves in the 364th Civil Affairs Brigade of the Army Reserve. Jim Jr. is a sergeant in the 218th Field Artillery Battalion as an artillery forward observer. He was mobilized with the National Guard and sent to Fort Hood, Texas, at the end of October. He will be with the 39th Separate Infantry Brigage attached to the 1st Cavalry Division, and will probably be in Baghdad by February or March. He and his wife, Rachel, celebrated their first anniversary during the past year, and moved into their first house just three days before the mobilization. Rachel works at a law firm. This past year has been a busy one for me and the Army. January I spent three weeks in Louisiana. May I was fortunate to be able to go to Thailand for a month. It was a very different and very hot place. I was able to make three dives while I was there. Shortly after I got back I got the alert notification for Afghanistan. Since the first week of October I have been on active duty in the Portland area trying to learn Dari, the language spoken in Afghanistan. I have about 200 hours of reading, writing and speaking under my belt. By the time you get this I should be at Fort Bragg preparing for a year long tour in Afghanistan. It is going to be very unusual to be away from home on Christmas, this will be the first one I have completely missed in 27 years. I am grateful that I was able to spend Thanksgiving at home. The family will be looking forward to Jim being home for Christmas. I am grateful our tours are during the same period instead of back to back, I will miss him for 18 months instead of 2-3 years. There may be a chance of getting leave in the summer and meeting with the wives in Europe, Lord willing.